This is the view from my computer right now. I really love the way this top turned out, its really bright and fresh, and its going to be a wonderful quilt to get out in the middle of January when I’m sick of winter. This is just gorgeous! I love how bright and cheery it is. Great fabric combination. That is beautiful. I love the bright fabrics. It is a happy quilt. 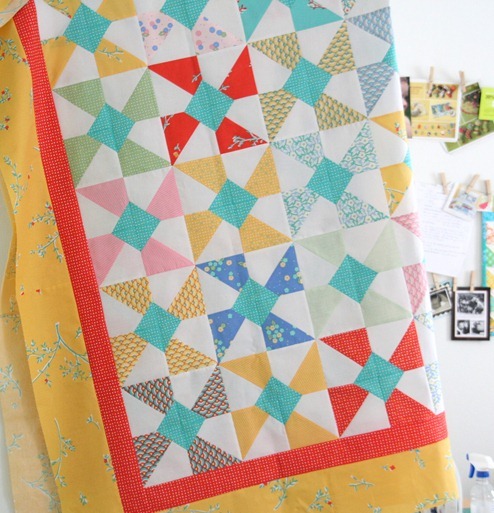 Love this fun bright quilt – thanks for sharing! I love this color combination! The yellow with the turquoise is beautiful. That's so beautiful. love the color combinations. I love that block design! What a nice job! Very pretty and refreshing! This is absolutely a cheery quilt. this is so bright and fun. i love it!!!!! Yes, I have tried so hard to resist this fabric line. This morning…I succumbed. Good thing, too, since I just saw your quilt! It's so fresh and cheery! Looks great in that fabric! I do enjoy the cheeriness! I have some Moda Bliss all set and ready to go for that pattern as soon as I get a little bit more time! this looks great! it's a very happy quilt! Every time I come to cluck cluck sew I get this crazy desire to quilt! Maybe it's because you're just so good at it! This is lovely. Thank you for so much inspiration! That is a great way to chase away the winter blues, beautiful quilt. So cheery! This will be great for winter! I love your quilt…the fabrics are really great for that pattern! I have this pattern and I think it's the next one on my looong list! Charming. Those colors are very happy. You're right, it will be perfect in January. I love City Weekend! That is one lovely quilt! Very striking. And crisp. I love it. Good job.